sitting on a train from Brussels to Brugge on a Sunday morning headed to ZandFeesten (the largest flea market in Flanders), while writing in my Classic Moleskine Notebook all the ways that I am going to organize my thoughts for this blog. The train passed through Ghent at 9:25 and then I was in a 4-seat cluster of seats with two guys drinking Leffe at 9:30 in the morning. We passed a farm with llamas, goats, and chickens. There were white cows sleeping in lush green meadows every couple of minutes, interspersed with herds of black and white cows roaming the fields. There were also several groups of cyclists enjoying the superb weather and small, undulating hills. You could see the edge of the flea market from the train station as we arrived around 10am. I strolled between the vendors' stalls on my roundabout way to the Church of Our Lady, Bruges. Along the way, I had a Belgian waffle and a cinnamon roll. Some of my favorite finds were a newspaper from WWII, a Batman-themed sewing torso, opium jars, classic VW miniature cars, and a Lego set that was so old it only had 3 digits (#263). After discovering that the Church of Our Lady was closed for Mass (on a Sunday, which seems obvious in retrospect), I walked into the town center and roamed the streets until I came to Den Huzaar where I had rabbit for lunch. After lunch, I stopped by the Belgian royal warrant holding Galler chocolatier for a box of chocolates. I talked with the store clerk about how even though there is also a Galler store in Brussels, the stores don't talk to each other because of the language differences. We also talked about the Bruges housing market, and it really doesn't seem that far out of reach (once you retire of course...to work in Belgium you have to be fluent in several languages to be useful). I returned to the Church of Our Lady and stood in line like everyone else to see Michaelangelo's Madonna and Child (that was also made into one plot point of the Monuments Men movie). While waiting, an impatient older American couple declared that they weren't going to wait in line or pay the (reduced) 2 euro admission rate for the museum because the church was free and the statue is in the church. I had nothing else to do so I followed them in, just to listen to them complain about how the place was under renovation and the only way to see the statue was by way of the museum (thus the reduced 2 Euro admission price). They left and I stood in line a whole 5 minutes for the museum before getting in to see the statue. While I was standing there, gazing on Michaelangelo's Madonna and Child, an Englishman asked his travelling companion if that was supposed to be Jesus and Mary. And if so, why didn't they just call it that instead? Sigh. 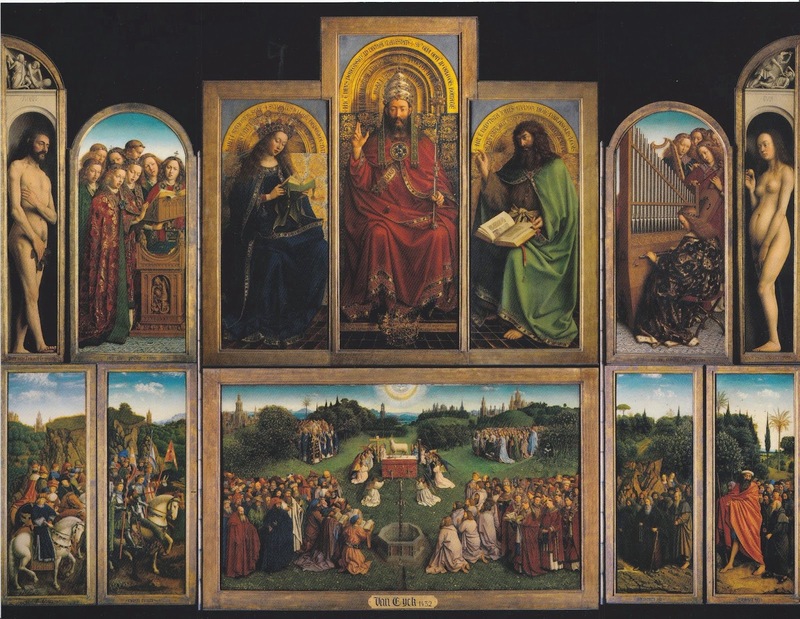 As I left the church, I decided that I could probably make it to Ghent and see the famed van Eyck altarpiece. I walked back through the park turned flea market and was on the train by 3pm. I arrived in Ghent possessing only the knowledge that the altarpiece was housed in the Saint Bavo Cathedral (thanks, Google). Relying solely on the public transportation maps to find my way, I took the #1 tram into the city center around 4pm. It wasn't hard to find the cathedral, as it's kind of designed to stand out. 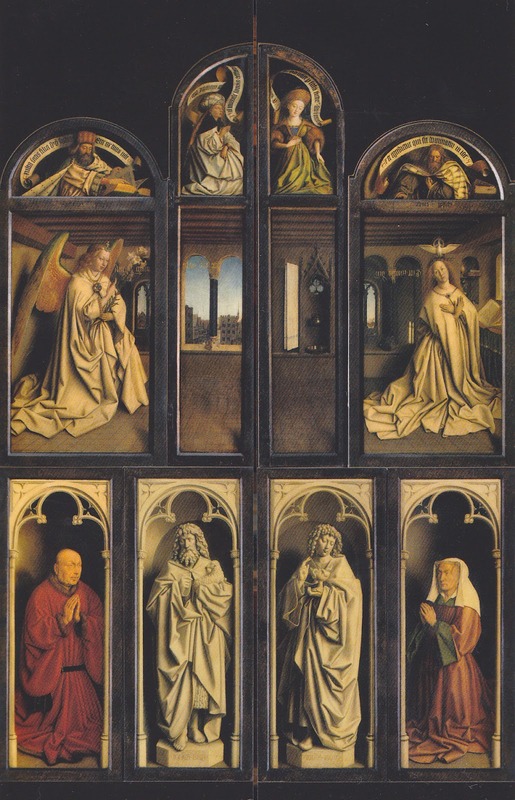 The Ghent Altarpiece is housed in a separate room that costs a couple euro to enter, but included in admission is an audio guide that describes the various panels. It was worth the effort to see the display in person, but some pieces were missing due to restoration (in their place were black and white copies). If I were so inclined, I could have gone to where they were being restored, but it was getting close to closing time by the time I'd get there. Also, the room was just a little bit muggy even with only a dozen people in there...I can only imagine it stuffed shoulder to shoulder with a peak crowd. What I think was most interesting was that the altarpiece could be in an open or closed position. While the closed position wasn't nearly as colorful as the open position, it was still very interesting. I had dinner at Ellis Gourmet Burger and paired a Duvel with a trio of mini burgers called "Classic, Funky Chicken, and Guaco-Waco Lamb". Delicious. The train back into Brussels from Ghent was standing room only, and I don't think I saw the conductor on either of the trains back from Bruges. I suppose you could say that the staff is waiting for Godot.